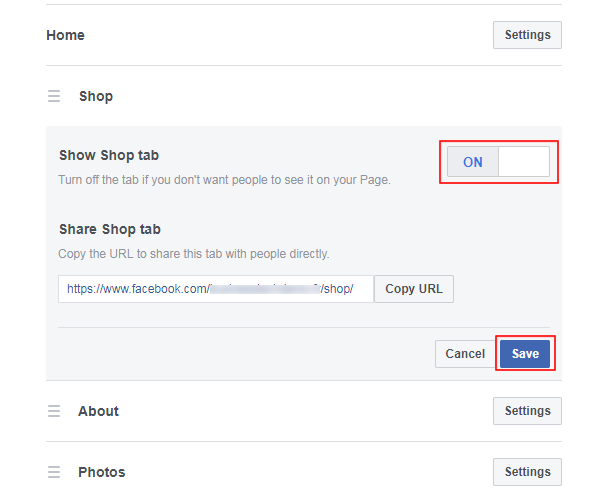 Attention, in this FAQ we atlk about the "Shop" tab offered by Facebook in the native tab list and in which you can import a product feed thanks to our "Dynamic Ads" module. 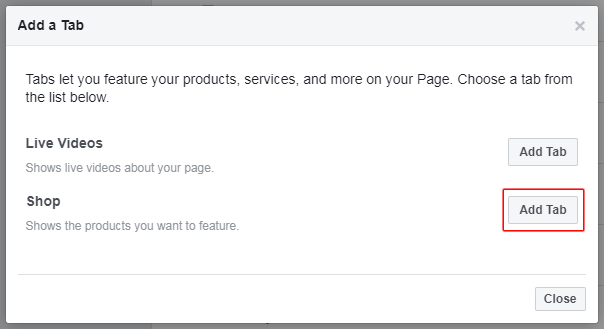 If you have our "Advanced Shop for Fan Page" module and you want to configure a completely customized shop tab, you must click here to go to the matching FAQ. To know more about the difference between the "Dynamic Ads" module and the "Advanced Shop for Fan Page" module click here. Go back to your Facebook page and click the "Shop" tab that appeared. If the shop section has never been configured or if it has been deleted, you must configure it before being able to add products inside. 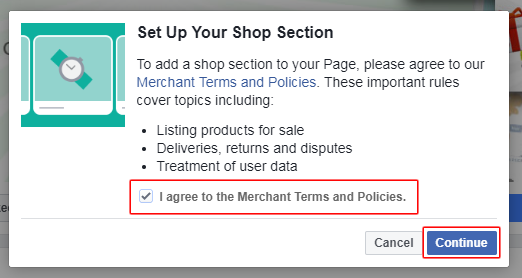 Check the "I agree to the Merchant Terms and Policies" field and click "Continue". You may need to enter your Facebook password again for security purposes. Choose the shop type, that is, how the visitors will be able to buy your products. Select "Check Out on Another Website" for the payment option if you want your visitors to be redirected to your website to finalize their order, or "Message to Buy" if you simply want them to contact you. Then, click "Continue". Be careful, do not be fooled by the type of shop because it cannot be changed unless you delete the Facebook shop and start from scratch. Your "Shop" section is now created. To import and automatically update your products in this tab, click here.